Sunday project: I built that evaporative cooler in a bucket I was talking about earlier. The original was intended to run on 12V power, but our camp is going to have a generator, so I substituted an AC fountain pump and a bathroom exhaust fan for the harder-to-find 12V units they picked out. The local home depot does not stock swamp cooler pads (“DuraCool”), so I made do with a cut-to-fit furnace filter. Seems to work OK, though the air here is not dry enough for the cooling effect to show up that much. Still, it was about an hour’s labor and $70 worth of parts, so it’s at least a worthwhile experiment. Friday project: I cut apart the cover for the Corbin seat that came with my Nighthawk, used the pieces as a pattern, and remade the whole thing out of leather. Then I stretched the new cover over the old foam and glued it down with contact cement. It was about six hours of work altogether, and the glue stank up the workshop something fierce, but the result looks pretty good. It feels good to ride on, too. Hello there. It took a few days to really recover from that backpacking trip, and I’ve had a lot to do in the meantime. The hike was about nine days, covering 85 miles and four mountain passes. It was the most intense hiking I’ve ever done: and yet it was only a third of the whole hike my younger sister Jeanine is doing. She’ll finish up on August 2nd by climbing Mt. Whitney, a 14,500 foot peak which is the tallest in California (and all of the lower 48). We started at Red’s Meadow, a campground near Devil’s Postpile. First day was fairly nondescript; we basically just had to climb back out of the lowland and gain some elevation on the way to the first pass. It was harder for me than her, since I was not acclimated to the altitude or accustomed to the mileage, but I kept on chugging and we made it to our intended camp site. The next few days were really nice. We camped near high alpine lakes, climbed snow-covered passes, tramped through meadows full of wildflowers, trekked along ridges, forded rivers, and generally had a great time. We got into a rhythm and generally arrived at our campsites an hour or two ahead of schedule, despite never making any particular haste to leave camp in the morning. Eventually we reached Muir Trail Ranch, where our resupply bucket was located. Resupply went fine but things got a bit more difficult after that. We tried to find the prominently-advertised hot springs across the river, but it turned out to require a mile of bushwhacking and a highly dicey log scramble across a deep, narrow river gorge. When we eventually found the hot springs they were small, muddy, and full of algae… not exactly inspiring. Oh, well, we made do and had a good evening regardless. The next three days were much more challenging. We got off to a slower start as we had to work our way back out of the bush to the trail, and then we had a long hot unshaded hike along the San Joaquin River valley and then up into the Evolution Valley turn-off. It was not a bad day but it was a very long one and we spent most of it climbing. The next day was the real killer. We climbed up to Evolution Lake, which was gorgeous, but quickly became mired in a slushy, hazardous, seemingly endless snowfield. The sun was hot and there was no breeze; we toiled up the unstable slope for hour after hour, never able to settle into a steady, efficient hiking rhythm. We finally reached the top of the 12,000 foot pass at 4 pm, having originally intended to lunch there, and spent a while just laying around recovering. Our schedule completely blown, we decided to have dinner, rally our strength, and go just far enough down the other side to camp at the first reasonable spot. This would make the following day harder but we were bushed and the thought of pushing on another five miles was unbearable. Our spirits rose as we crunched down the equally squishy far side; at least we didn’t have to keep hauling ourselves up this mess. We eventually found a good spot at what we called “Frog Lake” due to all the frogs hopping in and out along the shoreline. This happened to be my birthday, so I pulled out a flask of bourbon I’d packed for the occasion and Jeanine whipped up a special dessert she’d been carrying. We were so happy and relieved to have made it through the pass that we didn’t care about being tired and sore and wet and miles behind schedule. Next day, then, was another long, hot climb. We made up our extra miles by 11 am, then started climbing up to the Dusy Basin area. It was another mostly shadeless climb back up to 12,000 feet, and we were plenty footsore by the time we arrived, but there were lots of gorgeous mountains and meadows and cascades to look at. This was nearly the end of the line for me: in Dusy Basin the resupply crew met us. Mike and Joel continued on with Jeanine, and I hiked back out over the Bishop pass with Brian. I was eager to be done by this point so we trekked straight on til the parking lot, not even stopping for lunch. Of course we hit the first pizza place we saw in town. It was great. I’m glad I did it. I’m impressed with Jeanine’s ambition and really glad I could help her achieve her dream. It’ll be a long time before I have another chance to take a backpacking trip this intense, and I’m sure I’ll remember this one fondly for years to come. Back at my mom’s place in Sacramento after nine days of backpacking. Longest, hardest trail I’ve ever walked. Back from four days in Yosemite: that was fun! It was a big family-reunion trip, nineteen people total. We started at the Mono Meadow trailhead, off the Glacier Point road, and hiked down to Illilouette Creek for the first night. Scattered along the sand bar, our tents didn’t so much look like a single encampment as a whole miniature campground. The water is unusually high this season, especially for July, as California had the same late-blooming summer we did in the Northwest. The creek was roaring away with surprising force, and the normal ford was completely unusable. We scouted up and down a bit and found no good options; there’s a great log bridge a couple hundred feet downstream, but it sits right above a very turbulent rapid and the spray from the high water made it slick and dangerous. Solution? Engineering! Among nineteen people we had a good supply of burly dudes with upper body strength, and so we set about constructing a log bridge. We found a spot where the current split around a little island, located a couple of downed trees small enough to move, and started dragging the rocks and logs around. After a couple hours of hard work in the sun, we had built a rock pier on either side, and used ropes and levers to stretch two small logs across. So we abandoned our mostly-finished bridge, trooped upstream, took off our boots and waded across. It was quite a production, but it worked and it was definitely less labor-intensive than the bridge. Right, then: we trooped along through some open country full of blackened tree stumps, with little creeks and springs and wildflowers along the way. Above us, the domes of Mount Starr King; across the way, views of Glacier Point and Half Dome. We intersected the Panorama Trail, then tramped down the Nevada Falls trail, across the bridge, and on up to Little Yosemite Valley. The campground there is so well developed it hardly feels like backcountry at all. It has designated camp sites, fire rings, bear lockers, and even toilets; only the fact that there are no cars distinguishes it from any of the valley campgrounds. The next day was our Half Dome climb. Mom convinced us all to pack up our daypacks the night before, so we actually got our caravan out on the trail by 9 AM. It’s not a long hike – only three and a half miles – but it’s all elevation, so it’s not particularly quick going. What’s to say about Half Dome? It’s an unusual mountain climb, with very clearly defined stages as the geology changes. First you walk up through the forest for a couple of miles, past the trail junction. Then you wind your way up the side of the ridge to the tree line. Then you walk along the ridge, with bare scrubby trees and increasingly dramatic vistas, to the lunch spot at the base of the sub-dome. Then it’s up a rugged, sun-exposed granite switchback stairstep section to the top of the sub-dome. A little bit down to the saddle, and the views are wider and the exposure more terrifying – then you climb the cables. Our trip up the cables was more like a traffic jam than a normal climb; we were stuck with some genuine slowpokes ahead of us, who not only spent minutes at a time resting between each set of poles, but had themselves clipped in to both cables so that it was impossible to pass them without climbing outside the cable route. It was an exercise in patience: hanging on to the side of a mountain, just standing there, waiting for someone up above who seemed to be taking their time for no particular reason, while dozens of people just waited. Oh, well. We all made it to the top, and we spent an hour wandering around looking at things and taking lots of group pictures. The trip down was also somewhat slow but not as bad as the trip up, and then it was just a long steady downhill hike back to camp, where we all grabbed our swim gear and went straight for the river. We spent that evening celebrating Joel’s birthday around the campfire. There were miniature blueberry cheesecakes for all, a rhyming blues jam with rhythmic accompaniment (bear cans make great hand drums), and general foolery and merriment until late. The trek down from Little Yosemite Valley to (big) Yosemite Valley is always an interesting social experience. You follow the line of the Merced as it drops first over Nevada Fall and then Vernal Fall; the latter is one of the most-visited attractions in the park, so the trail gets increasingly crowded the further you go. By the time you’ve descended the Mist Trail – a veritable shower this year, clouds of spray drenching us as we walked – you’ve left the back country and entered the land of poorly-shod, inexperienced day-hikers who stare at your towering pack like you’ve just come back from the Moon. Our first destination was of course the pizza deck at Curry Village where we tore through seven large pizzas and a dozen or two glasses of beer, then headed for the showers and demolished a stack of clean towels. Oh yeah. It’s a beautiful place. I love Yosemite. Things have changed, though; the Valley was crowded and full of cars. We spent literally hours sitting in stop-and-go traffic jams just entering and leaving, and ended up missing the Glacier Point bus due to the unexpected congestion. I missed the sense of calm welcome I’ve always had in Yosemite before. It’s been thirtyish years now, and things have changed; I’m not sure I want to go back to the Valley now. Process isolation rediscovered as a programming pattern: an argument for the idea that fork/exit style process management is a useful model for software development within processes and not just between them. Just learned about a place called Mars Restaurant, in the U-district. I don’t care what the place is like – I have to go there and check it out. 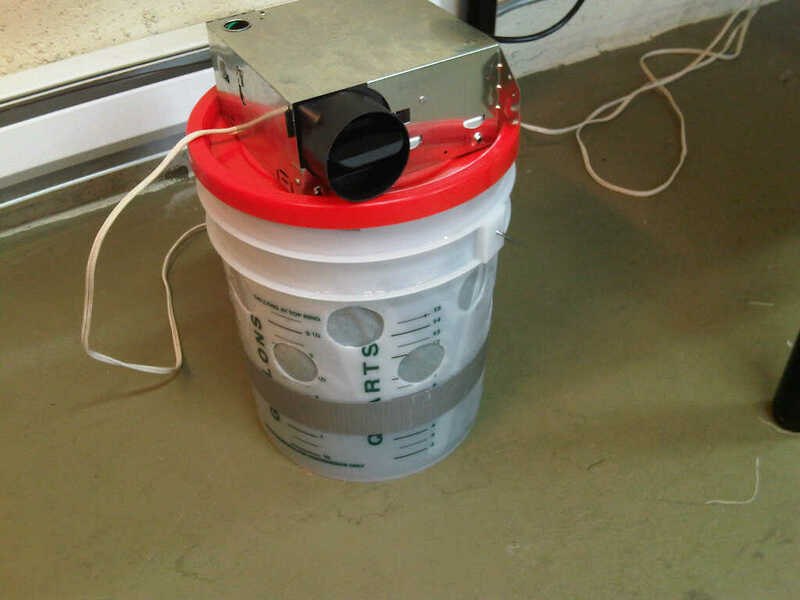 Here’s an article demonstrating how to build your own swamp cooler, capable of dropping air temperature by 20-30 degrees, out of ordinary hardware store parts. I spent the morning building a big work table for ALTSpace. The top is from the 4×8 workbench Adam and I built at the old Rocket Factory; we broke down the legs and wall mounting when we moved out, and the tabletop has been leaning up against a wall in ALTSpace for the last four months. I woke up early this morning, and felt inspired to build… so I went to Lowe’s and bought lumber. Construction took about three hours. I laminated pairs of 2x4s together with screws and glue for the legs, then bolted on locking swivel casters. I mounted the legs into the corners of the old tabletop, which was already framed with 2x4s, using strong-tie gussets. Some more framing underneath added cross bracing and a platform for a future storage shelf, and now it’s done. We have plenty of tables at seated height, so this one is a standing-height work surface: 39″. Once we get it cleaned up and polish the edges some it should make an excellent fabric layout table, and we can push it up against a wall to serve as a bar during artwalk or other parties. Ava and I are leaving for our backpacking trip soon, so my to-do list is getting full quickly. I have some last oddments to pick up at REI, a rental car to book (since our car is not back from its transmission repairs yet, alas), and a little bit of packing to do. 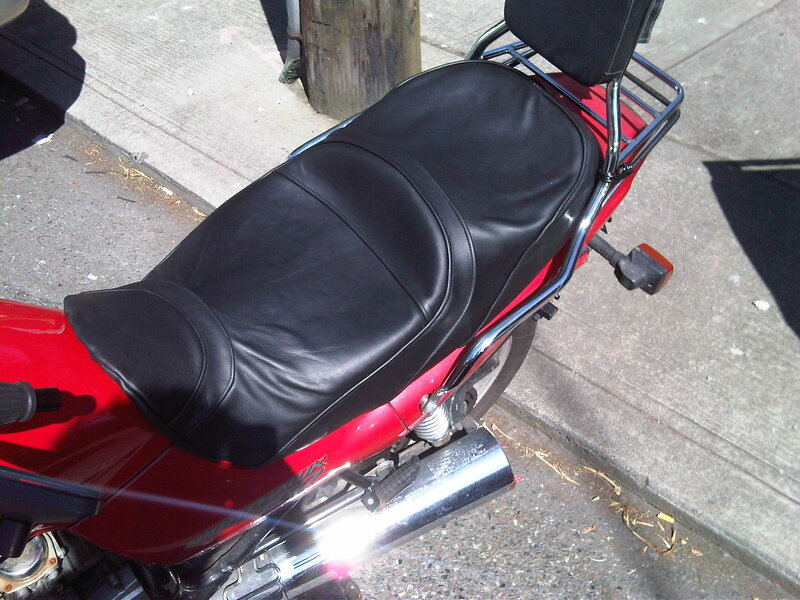 I picked up a cowhide yesterday; my new motorcycle came with a spare Corbin seat, but its stitching is coming apart. I opened it up thinking I’d restitch the seams, only to discover that someone had tried that already. The vinyl fabric doesn’t look like it would hold up to a second restitching, so I decided to rip the whole thing apart and use it as a pattern for a new cover made of leather. This afternoon I’m going to do a quick little starter project to familiarize myself with the material: I have a really nice utility knife which would be good to bring on the backpacking trip, but it’s a fixed blade and has no sheath. 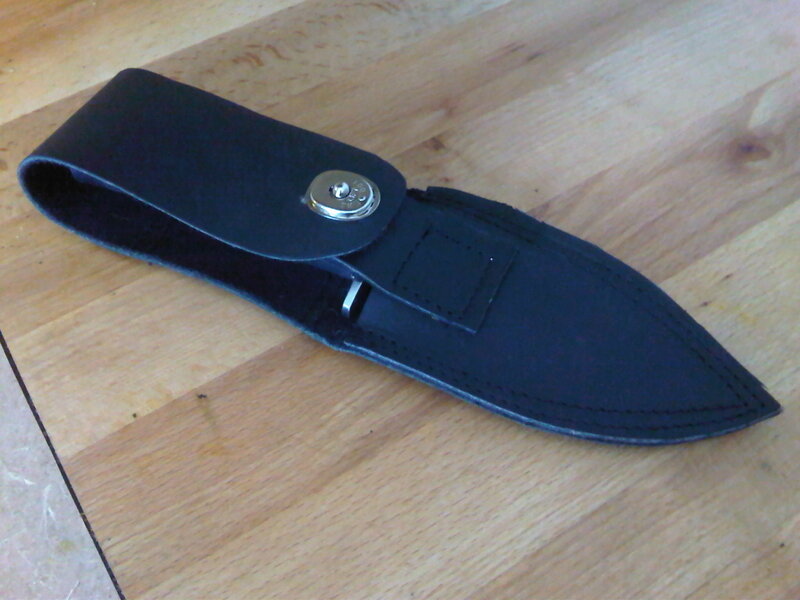 Seems like a simple enough project… I hope? I picked up this German military surplus overcoat a few months back; it was on sale at Metro for something like $20, so I bought two. One I’ve been wearing as-is – it’s a nice grey wool coat with classic lines – and the other was destined for fashion hackery. 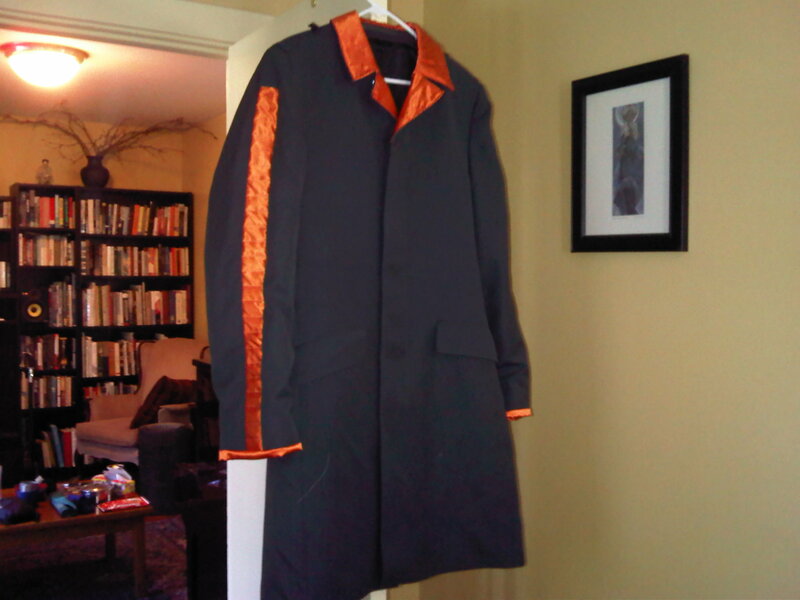 I decided to complement the flat grey with some shiny orange, relining the cuffs, insetting quilted panels in the sleeves, and lining the collar in similar mode. I might take another pass at it later and add a hazardous-materials style flame appliqué to the back, but it’ll do for now. It’s my last day working for Synapse. I’m basically just cleaning up and checking things in today. I’ve long since passed on all useful knowledge about this project, and while my teammates say they’ll miss me I’m sure they will carry the project on without a hitch. I’ll be off work for all of July; my first day at Google will be the first of August. I like Synapse; it’s a good company and I’m going to miss the people here. I’ve learned a lot about embedded software development, and about electrical engineering too; comparing the lights I built for the Shame Project with either of the two previous years’ Burning Man projects makes the difference obvious. I’d expected to spend more time here, but the opportunity to go work for Google is definitely not to be missed.